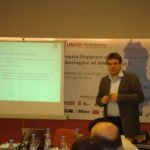 During 2011, AITA was seriously committed on promoting regional and international standards for a better management of companies in the information technology sector, particularly among the AITA member companies. 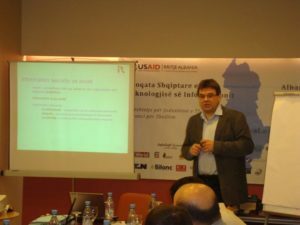 The most important project in this direction was IT Mark project funded by USAID Rritje Albania and main implementer ESI Center Eastern Europe, which aims at supporting 5 member companies of AITA working in the field of software development and service delivery in the field of IT to reach the IT Mark certification. DM Consulting Services and Infosoft SD have previously implemented IT Mark Basic standard and this year will work respectively for the implementation of IT Mark for Services and IT Mark Premium standards. Three other companies ikubInfoSoft, Tetra, and Intech Solutions will work for implementation of IT Mark Basic and IT Mark for Services. In September-October 2011, AITA was engaged to organize the IT Mark Overview training which was open to General Managers and employees of the five companies participating in the project and the Introduction to CMMI training which was open to General Managers and employees from other member companies of AITA and IT managers of other companies and institutions working at daily basis with software as well as universities and government institutions.